Can wearing Yellow sapphire stone with metal silver instead of gold prove equally benevolent to wearing this stone with Gold? Being a gemstone seller & astrologer, I have spent a large chunk of my life responding to these types of question. Whether these questions sound to me repetitive and boring,but over the years, I have realized that people still have so many confusions regarding the usage of gemstones. People have lots of misapprehensions and doubts in their mind regarding the right usage of gemstones. These doubts further give rise to several problems. Since we know that gemstones are extremely powerful entities and misusing it could prove disastrous for a user. Therefore, one should be extra cautious while wearing them. And he/ she should clarify all his doubts before proceeding to don these authoritative stones. 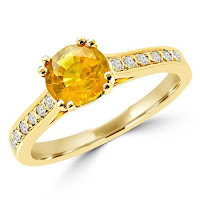 Among the several questions posed to me, one question which is commonly being raised by gemstone lovers is that, can they wear a yellow sapphire stone with silver or other metal instead of suggested metal by an astrologer? As per astrologers, a yellow sapphire stone is associated with the planet Jupiter. It is being propagated that if Jupiter exists in your positive houses of the horoscope would bring happiness, health, wealth and prosperity in your way. On the contrary, if it is aligned in negative houses of the birth chart would evoke negative forces in your life. And become solely responsible for introducing dreadful consequences. Knowing the unprecedented positive and negative consequences of this stone, one should strictly pursue all the guidelines suggested by the astrologers. 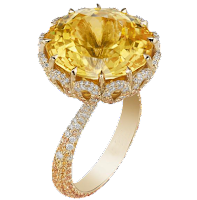 And astrologer firmly believes that wearing yellow sapphire incorporated with gold pleases lord Jupiter in a more efficient manner than embedded in any other metal. So, if you want to gain more benefits using yellow sapphire stone then wear natural yellow sapphire with gold instead of metal silver. Nice blog, buy original gems that only give the correct effects for your rashi, buy original gems for your money, the best place is gemstone universe. thanks for sharing this nice blog and keep updating. Nice Blog Thanks for sharing, Buy Natural and Original gemstones at Best prices visit below links. Yellow Sapphire is also Known as Pukhraj or Pushparagam.It is widely known for its power of ensuring success in every sphere of life.